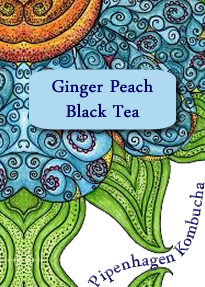 Kombucha is a lightly effervescent fermented drink of sweetened black tea. Kombucha is a probiotic beverage, claimed to have several beneficial effects on health. Making this home brew is very easy, and it is an extraordinarily anti-oxidant rich elixir. 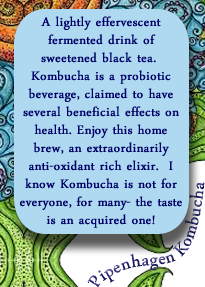 I know Kombucha is not for everyone, for many- the taste is an acquired one! Avoid any contact with metal both during and after brewing. This can affect the flavor of your kombucha. 1. Make the Tea Base: Bring the water to a boil. Remove from heat and stir in the sugar to dissolve. Drop in the tea and allow it to steep until the water has cooled. 2. Add the Starter Tea: Once the tea is cool (should take several hours) strain out the loose tea with the tea filter. Pour tea into the olive jar and stir in the starter tea and gently slide the scoby into the jar with clean hands. Cover the mouth of the jar with a coffee filter secured with a rubber band. 3. Ferment for 7 to 10 Days: Keep the jar at room temperature, out of direct sunlight, and leave it be- check on the kombucha and the scoby periodically but do not disturb it. Ferment for 7 to 10 days. A new cream-colored layer of scoby should start forming on the surface of the kombucha within a few days. 4. 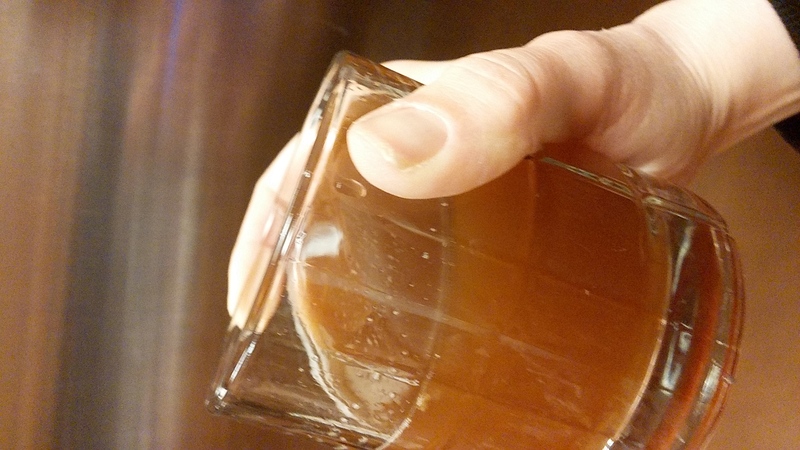 Use pH strip to test: Kombucha should reach a pH level of between 2.6 and 4.0 prior to consumption. 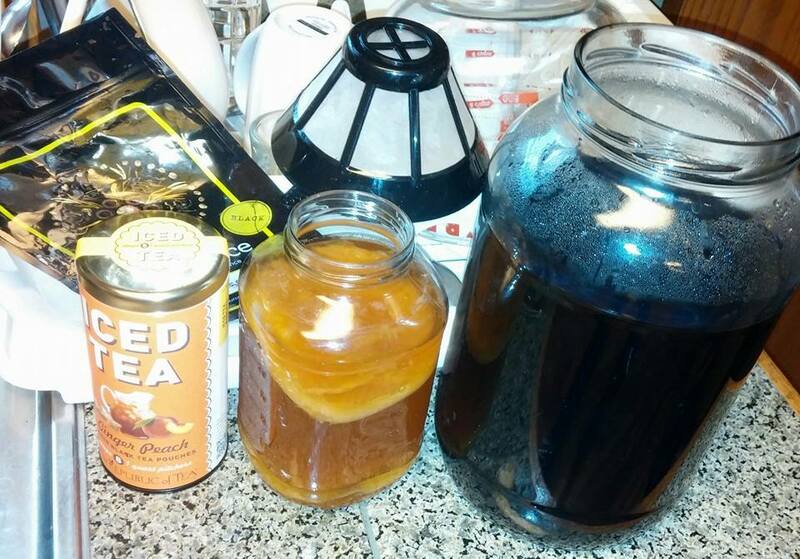 Be sure to measure out your next “starter tea” from this batch of kombucha (2 cups per scoby) and pour it into a mason jar with the scoby as stated above. Pour the rest of the fermented kombucha (straining, if desired) into bottles. Do not use anything metal. Use plastic utensils and a plastic funnel. Metal will react with the kombucha. Before you remove your SCOBY, sanitize your hands with white vinegar. Do NOT use soap, you could kill your SCOBY. Sanitize your botttles with hot water or white vinegar. I ran mine through the dishwasher with no soap, just hot water. Clear glass ONLY! You can buy clear bottles online or reuse soda bottles. Place a funnel into your clean bottle and pour your kombucha right into the bottle. Fill the bottle almost to the top, leaving a maximum headspace of 1″ or less. The less you have the more carbonation that you will have. Do not shake kombucha, it can explode. The higher you fill the bottle, the more likely you are going to need to relieve the gas bubbles a bit.